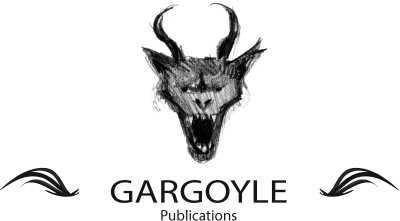 Hi I’m Axel Matfin, Editor in Chief here at Gargoyle. When I’m not working on Gargoyle projects I write action adventure novels and publish them. Since 2012 I’ve published three novels, with my fourth coming in the fall of 2016. When I first got started in physical publishing it was because I was tired of sharing my work through the internet. I had started blogging in 2004 and maintained a journal blog and a short story blog for about eight years. I wrote because I liked writing and wanted to get better at it. In 2010 I started to feel that my work was lost in a sea of content and began to withdraw myself from publishing online. I felt that the grind of blogging, keeping up with weekly content and always having something to say about everything was tiresome. I wanted to take my time and write pieces that were well thought through and had taken me more than two drafts. In the summer of 2010 I published my first ‘zine entitled Stay Positive. It ran for seven issues of varying states of quality in both design and content. It taught me about physical publishing, distribution and the importance of properly edited material. There is no feeling more spine chilling than having just printed 300 copies of something, paid out of your own pocket, and realizing you have multiple spelling mistakes. When I finished Stay Positive in the Summer of 2011, I decided that I wanted to focus my attentions on a novel that could encompass all my particular tastes and interests: Crime, Mystery, Noir, Detectives, Corruption, Conspiracy and general comic book themes. Summer 2011 I started writing The Bartender, a action adventure pulp mystery story about a troubleshooting bartender named Tom Wolfe trying to figure out who send him a handgun, and why. It’s a three book series that has allowed me to explore the previously mentioned tropes and concepts over multiple years. Each book in the series is connected a continuous underlying story while still maintaining itself as a complete story. Each volume is set in the the same world, with the same characters although the presentation is stylistically differentiated through the sliding lenses of pulp genres . The process of creating and publishing these books has taught me how to put together a serious publication and work with freelance artists. These books have taken almost five years to complete. They are available for order through Amazon or wherever you purchase books. More recently I published a illustrated pulp novel entitled Lazlo: The Hunter, which is a three story book about a Filipino action adventure hero who journey’s the globe fighting evil. Lazlo was conceived as a modern day iteration of popular pulp characters of the 1920’s and 30’s such as The Shadow. Lazlo deals lethal, and often cosmic, justice against the villainy that we’re confronted by in the 21st century. Lazlo: The Hunter has had 3 print runs, selling out each time although they might still be available at Lucky’s Comics, RX comics or The Comic Shop in Vancouver. A follow up series of single shot pulps is being produced for release within 2016. My projects are entirely self motivated. I did not receive money advances for my work, nor have I been made wildly financially successful for my efforts, but when it comes to writing I feel the permanence of a publication must be the author’s reward. I count myself lucky that I have the motivation and ability to assemble publications. Many artists do not. That’s why I’ve created Gargoyle. So that maybe the great up and coming artists of this city can share their craft and the crafts of others. No one would publish the stories I wanted to write, so I published them myself. I look forward to providing people with avenues to present their art that they may not otherwise have had. I look forward to giving people chances to express themselves in a way that no other publishing company will.